NSW Rural Fire Service volunteers are bracing themselves for a repeat of last Wednesday's bushfire inferno on the Lower Clarence, as conditions may change for the worse and cause a flare-up. Firefighters worked consistently over the weekend to establish and strengthen containment lines to the north, south and west of the Brooms Head village which last week escaped a fire onslaught. Rural Fire Service Superintendent Chris Wallbridge said weather conditions were predicted to change mid-week. Firemen were doing everything that they can to prepare for any flare-up. 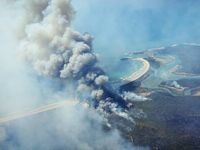 “North-westerly type winds and hot temperatures are predicted for mid-week so we are putting a lot of effort in now to get the situation under control,” he said. Although no homes were under threat at the time of print, the Rural Fire Service was advising residents that they may experience the effects of smoke as back-burning operations proceeded. Residents were warned to close doors and windows as well as take other appropriate precautions. 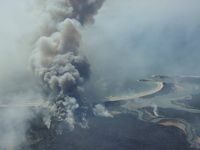 “We have managed to back-burn the area and we are currently reinforcing and working to deepen the containment lines,” Superintendent Wallbridge said. The southerly breeze over the weekend and the drop in temperature helped crews control and contain many of the fires that had previously been burning out of control. Firefighters continued overnight to strengthen and mop-up established containment lines as they tried to prevent any further spread of fire.